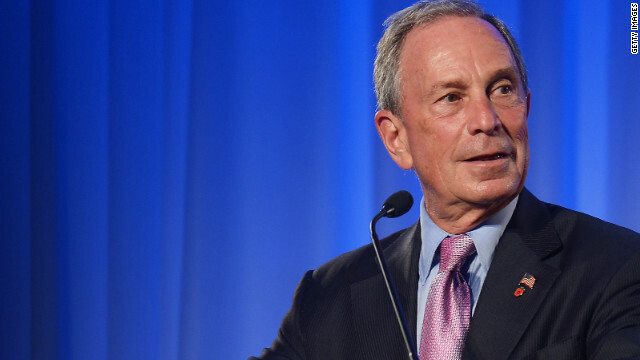 Large portions of sugary drinks lead to obesity, New York Mayor Michael Bloomberg says. New York Mayor Michael Bloomberg has created a soda controversy that may take more than a 44-ounce Big Gulp to quench. Citing what he says is the contribution sugary beverages make to obesity in the U.S., Bloomberg proposed a ban the sale of any sugary beverage over 16 ounces in any of the city's restaurants, delis, movie theaters or even street carts. “Obesity is a nationwide problem, and all over the United States, public health officials are wringing their hands saying, ‘Oh, this is terrible.’ New York City is not about wringing your hands; it’s about doing something. I think that’s what the public wants the mayor to do,” Bloomberg told The New York Times in making his proposal last week. Soda has been a hot topic across the Web since. Bloomberg has his supporters, including a former president. "It's basically too much sugar going into the body. We can't process it all. So, if you get rid of these giant, full of sugar drinks and make people have smaller portions, it will help," former President Clinton told CNN's Piers Morgan. "Good for Bloomberg," writes CNN contributor David Frum. "Obesity is America's most important public health problem, and the mayor has led the way against it. This latest idea may or may not yield results. But it is already raising awareness. Even if it fails to become law, it ought to prod the beverage industry into acting as more responsible corporate citizens." But Coca-Cola is among the corporate citizens that don't quite see it the way Bloomberg's supporters do. The company's vice president of science and regulatory affairs, Rhona Applebaum, says the government should help get kids more active before it tries to cut their soda quaffing. If we're going to hold the sodas, we should hold the fries, writes Mark A. Pereira, an associate professor in the Division of Epidemiology and Community Health at the University of Minnesota. "What's the rationale behind targeting a single dietary factor in the sea of unhealthy foods and drinks that barrage us every day?" Pereira asks on CNN.com. Celebrities are taking sides, too. Alec Baldwin writes in the Huffington Post that he supports the mayor, likening America's addiction to sweets to an addiction to drugs. "Many of those who cry loudest about measures like the one Bloomberg has proposed are probably sick, too: hooked on high fat, high sodium and high sugar diets who don't want their 'drug' taken away," Baldwin writes. Put "Daily Show" host Jon Stewart among those opposed to the mayor. Sucking down a large, movie theater-sized soda on his show, Stewart sarcastically said he loves Bloomberg's plan. "It combines the draconian overreach people love with the probable lack of results they expect," Stewart said. Bloomberg, Stewart said, had put him in the uncomfortable position of having to agree with conservative commentators like Tucker Carlson. Market experts say Bloomberg's plan could backfire, according to a report in the Los Angeles Times. “Whenever people feel like they’re being restricted they begin to resist. And that creates a real headwind for a policy like this,” David Just, a professor and food marketing specialist at Cornell University told the Times. “I’ll show them; I’ll drink three sodas” may be their reaction, Just told the Times. Julie Gunlock, director of Women for Food Freedom and senior fellow at the Independent Women’s Forum, sees merit in that argument. "New Yorkers are known for their independence and their brash resistance to such heavyhanded efforts," Gunlock writes in the New York Daily News. Just outside the city, Paul Mulshine, writing in The Star-Ledger of Newark, New Jersey, says a ban isn't the answer, but a tax is. "You can’t outsmart the market. If you want less of something, whether it’s soda or gasoline, tax it. If you want more of something, cut the tax on it," Mulshine writes. Of course, he says, ban or tax, it really makes no difference to him. "I drink beer. And that’s already taxed," Mulshine writes. "Good thing, too, or Mayor Mike might put a limit on mug sizes." Soft drinks public enemy No. 1? How 'bout a 1,500-calorie smoothie? Lets put it like this. I'm at a concert with a friend and he orders three beers at the concession stand. The worker, and this a state run venue, says he can only have two at a time. He orders one. He chugs it in a couple seconds. Slams the empty down and says NOW GIVE ME TWO! The point is... instead of getting a 16 ounce drink, people will buy two 12 or eight ounce drinks to get what they want. How in the hell is this going to work? Prohibition did not work, laws on drugs do not work, but limiting the size of a sugar infested beverage is going to make us less obese? Next is taking away all you can eat buffets at Ponderosa. What a bunch of numbnuts we elect to public diservice. Talk about funny. You give Obama a blanket excuse for his missteps by parroting "He inherited this Bush mess." When do you begin to hold Obama accountable for actually KEEPING most of Bush foreign and domestic policies? How about this? I'll start paying a slight bit of attention to health advice from government officials when the president stops smoking and the US Surgeon General addresses HER obesity problem. I don't even drink soda, but I'll defend with my life someone else's right to drink it. People have a right to drink soda, and as much of it as they want too. Why don't these people attack alcohol? When was the last car accidenct caused by soda? When do people fight from drinking soda?